South Korea's Amorepacific is launching its hydration focused premium brand LANEIGE in Europe exclusively through Sephora. 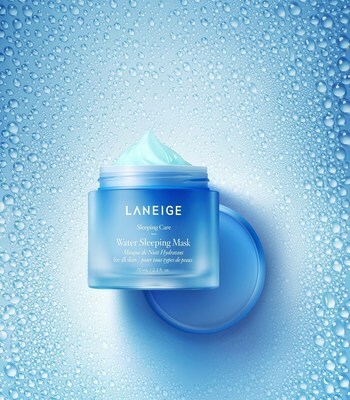 The LANEIGE range available at Sephora includes the 'Water Sleeping Mask', a popular night time skincare product sold every 11 seconds around the world. Created in 1994, LANEIGE has at its base 25 years of research and mastery of the science on the interaction between healthy skin and water to create deeply hydrating complexes. With hydration at the core of its brand DNA, LANEIGE brings skincare to a new level of excellence with clinically proven technologies including its WATER SCIENCE™ technology (transformation and optimization of natural water ingredients into effective hydration formulas); as well as the use of hydro-ionized mineral water (a special formulation of six moisture-maximizing minerals -- zinc, manganese, magnesium, sodium, calcium, and potassium). The first of Amorepacific's major brands to be launched and sought internationally outside of Korea as early as 2002, LANEIGE has over the years won over K-beauty and skincare enthusiasts across Asia, North America and Oceania with innovative textures and self-care routines. The European launch collection includes Laniege's global best sellers: the Water Bank Moisture Cream with hydro-ionized mineral water that provide deep hydration; and the Water Sleeping Mask, the renown night-time skincare item sold every 11 seconds around the world. "Amorepacific is thrilled to have Sephora as the exclusive retail partner for LANEIGE," said Thierry MAMAN, General Manager of Amorepacific Europe. "Through this partnership we will finally share this trusted Asian brand with European customers – the simple yet effective, immediate hydration for healthy skin." Previously, Amorepacific's European business included its luxury fragrance brand Goutal Paris which the company acquired in 2011. In 2017, Amorepacific launched its luxury skincare brand Sulwhasoo in Europe exclusively through the Paris Galeries Lafayette, as the first Korean skincare brand to open an exclusive store there. Since 1945, Amorepacific has had a single, clear mission: to present its unique perception of beauty -- namely what it calls 'Asian Beauty' -- to the world. As Korea's leading beauty company, Amorepacific draws from its deep understanding of both nature and humanity to pursue harmony between inner and outer beauty. With its portfolio of over 20 cosmetics, personal care, and health care brands, Amorepacific is devoted to meeting the various lifestyles and needs of global consumers around the world. The company's research hubs located around the world are dedicated to sustainable R&D that combine the best of natural Asian ingredients and advanced bio-technology. With its world-class products, Amorepacific is acclaimed for the innovative ways in which it is transforming global beauty trends.